Four peregrine falcon eggs started hatching Thursday in their nest perched on a San Francisco Financial District high-rise, revealing four furry falcon chicks by the end of the weekend. “The chicks have hatched,” said Guy Lasnier, a spokesman for the University of California at Santa Cruz Predatory Bird Research Group that monitors a falcon nest at PG&E San Francisco headquarters on 77 Beale St.
Glenn Stewart, director of the UC Santa Cruz Predatory Bird Research Group, said the first egg of the season appeared Feb. 19, and incubation, which typically begins after the appearance of the third egg, lasts about 33 days. Right on schedule three chicks hatched on Friday and the final egg hatched early Saturday morning. The mother and father tend to the chicks, who will be almost full grown in three weeks, Stewart said. At that point he will put identification bands on their legs, as a way to continue monitoring their habits. The chicks have not yet developed flight wings, which take between 41 and 44 days to grow, according to Lasnier. Stewart said once the birds can fly the nest they tend to stay in the San Francisco Bay Area. The region provides a good climate and plenty of food. The mother does most of the feeding for the young birds and the father does most of the hunting. The predatory birds eat other birds, which they catch mid-flight. In downtown San Francisco Stewart said pigeons are the most vulnerable prey. The birds are perched on the ledge on the unoccupied 33rd floor, and never touch the ground, Stewart said. “They are an animal that lives in the air,” according to Stewart. Luckily for those bound to the ground that means the predatory bird has no interest in humans. 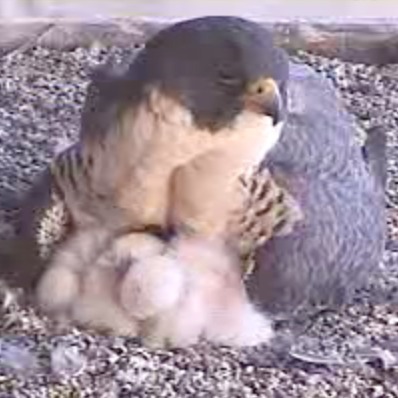 A web camera provides up-close live footage of the chicks feeding, roosting, resting and growing. The camera has been observing the birds since 2005. “It’s a chance to see wild nature as it unfolds, it just happens to be in downtown San Francisco,” Stewart said. The nest web camera can be found at www.scpbrg.org.